The A6300 is the latest in a long series of APS-crop sensor mirrorless cameras from Sony. The A6300 follows the NEX-5 -> NEX-6 -> A6000 line of iteration, and leaves room for a higher-end model. But for the present the A6300 is the top end of Sony’s crop sensor mirrorless cameras. With a 24mp Exmor sensor, phase detection on sensor, and a built-in 2.36m dot OLED EVF that can run at 120 fps, there’s a lot to like just in the basic spec line. Add in a 921k dot tilting LCD, both a built-in flash and hot shoe, plus some additional user controls, and we have a fairly complete camera. Yet we’re not done. Dust and moisture sealing have been put into a magnesium-alloy body (key elements shown above). We’ve got built-in WiFi with NFC, too. On the video side the A6300 will do full sensor 4K (UHD) at 24/25 fps, or UHD 30P with a crop of the sensor. There’s a microphone socket, but no headphone monitoring socket. Sony has added a ton of video features, including S-Log2 and S-Log3 gamma, time code, zebra striping, and more. Phase detect autofocus has been expanded from 179 points to 425, and there are additional refinements to the features and performance of the autofocus system. The EVF went from 1.44m dot to 2.36m dot, and gained a faster refresh option for shooting continuous action. The new EVF has a .7x magnification (and has a diopter correction ability). 4K video (UHD) was added, and 1080P at 120 fps was also added. The new camera is slightly deeper in size (.1” or 4mm) and slightly heavier (2.2 ounces heavier [60g]). Plus the body got weather sealing. Other than that, things stay pretty much the same between the A6000 and A6300: same tilting LCD, same shutter (1/4000 max), same 1/160 flash sync speed, same battery (though the A6300 ekes out more shots from it at 400 shots CIPA). There are some menu structure changes from the A6000 to the A6300, but frankly, that didn’t solve any menu issues other than being able to move more easily between an A6300 and A7 Mark II model. Some wonder whether the sensor is the same or different. I’d say same basic structure and photo diode, slightly different on-board electronics, including the use of copper wiring for data and power lines, which has reduced the already low Exmor profile slightly lower. In other words, don’t expect a huge difference in dynamic range and other still capture properties; most of the changes seem to be in dealing with sets of pixels for video and focus and the speed at which they can be addressed. ISO remains from 100 to 25,600, with an extension to 51,200 in a pinch. Data is saved to raw files in Sony’s old “uncompressed format,” which is actually compressed ;~). The A6300 does not have the truly uncompressed format that was added to the A7 Mark II series, and thus can suffer from edge artifacts on very high contrast areas. The built-in flash is a very tiny pop up that won’t clear the hoods on many of Sony’s lenses. The built-in flash puts out a GN of 6m at ISO 100, which is somewhere between wimpy and useful. The big drawback of flash use on this camera is the 1/160 flash sync speed, which is slow for a higher end camera like this one. In continuous shooting, the A6300 can manage 11 fps for up to about 22 frames for raw files, double that for JPEG. With the new faster EVF mode active, you can get 8 fps with essentially a live feed of what the sensor is seeing. In other words, no more of the slide show effect in continuous shooting. This makes it easier to follow action, though the way Sony handles this it looks a bit like those old flickering silent films in action. Sony seems to have finally given up on its Memory Stick aspirations: the A6300 is SD only. But Sony still continues with their PlayMemories conglomeration, which includes the ability to control the camera from a smartphone and to download and buy programs that extend the capability of the camera. Unfortunately, some of the useful apps, like time-lapse, aren’t built in, while most of them still aren’t particularly helpful. Sony really needs to turn app development over to third parties if they want things that will really show off this ability. The overall “style” of the A6300 is somewhere between what we call Soap Bar and Rangefinder. Call it a Rangy Soap Bar. The Soap Bar connotation implies a basic rectangular box that’s typically slightly slippery due to use of plastic or metals as the exterior material. Sony manages to overcome that with a reasonable-sized hand grip that’s covered with a rubbery material. Up top we have two dials (Mode and Command) and customizable button next to the shutter release. On the back we have the usual Direction pad with a control ring, plus five additional buttons, three of which can be customized. As with many small camera designs, Sony overloads the Direction pad with button functions (which also can be customized). Virtually all of the buttons and controls are small and difficult to find with large fingers. The A6300 is made in Thailand and retails for US$1000 (body only). I’ll admit right up front that coming to a conclusion about the A6300 is going to be kind of tricky. Sony’s packed a fairly big APS sensor into a very small body, as they have since the early NEX models that precede the A#### models. Something has to give in the mix. To Sony’s credit, they put the hot shoe and tripod socket in line with the lens and the tripod mount is far away from the battery compartment door, which means that our options for mounting plates on the camera are better than were on some previous models. The tilting LCD and the left aligned EVF aren’t going to get anyone’s complaints, either. As usual in camera handling it comes down to controls and menus. There’s some good news with controls. We’ve got a fair number of them, and some very deep user customization with many of them. The best thing Sony did is the position and design of the AF/MF and AEL switch/button. This falls perfectly under the right thumb position and becomes a critical go to control for me. You can customize the button, and the button can have different functions with the position of the switch. Nice. I’ve got AF-On programmed to the AF/MF position, and AEL lock hold for the AEL position (though Zebra is another very useful function to put here). One thing about that switch/button though: I noticed in using the camera off a Blackrapid strap for any period of time the switch tended towards a random position due to handling: I had to check it every time I picked the camera up for shooting. The power switch is right there at the shutter release, which I think is pretty much the preferred placement for all serious photographers, as it’s right where we can find it with our fingers when we put the camera to our face. Moreover, Sony’s version of this switch has clear on/off positions, not the soggy imprecise switches that Nikon put on the Nikon 1 models. From there things go downhill. The control dial on the top plate is in an awkward place (and makes it more likely you’ll hit the red record video button if you start looking for it by feel). Moreover, it can’t be programmed other than to switch its use in Manual exposure mode (either shutter speed or aperture; the other item is controlled by the ring around the Direction pad). So we have a command dial that’s not really doing a lot for us. The primary custom buttons are on the top plate to the right of the shutter release and in the lower right corner of the rear of the body. They’re difficult to find by touch, and with even the lightest gloves on it will make them impossible to find by touch. Given that we have 61 (!) things that we can program these buttons to do, they need to be better positioned and easier to find. Overall, most of the user controls feel a bit cheap and not fully thought through on the A6300, a problem that plagued earlier models in the crop sensor lineup, too. I’m also liking the lens mount release button less and less the more I use Sony A series cameras. It’s snugged into the area between the lens and the hand grip, and while this protects it from accidentally being pressed, it just feels like the wrong place to me. With some lenses mounted, the position is difficult to get to with large hands, too. While a lot of folk will be tempted to "one-hand” the A6300 while shooting, don’t. I’m perfectly comfortable with bracing the lens with my left hand, and given the left-side EVF, what I see in both my use and that of others is that one-handing the camera introduces jiggle while shooting. Sure, go ahead and count on that IS system to fix that, but I’m a firm believer in that IS should be off unless it is necessary to be on (see below). One thing I still don’t like is that most buttons don’t “awake” the camera when it has gone into power conserve mode after a shot. Below I describe the Fn button’s beneficial use, but I actually have to hit two buttons to get to the Fn button functions if the display has powered down. Note to Sony: all buttons—or at least most—should reactivate the camera. Right, I know why you don’t: you’re afraid that accidentally hitting buttons during transport will just drain battery or randomly set the camera. Well here’s my take: you don’t cripple handling to fix a different problem. Sony’s menu system is a mess, frankly. It’s starting to bug me more and more with each new camera iteration, and complex menus like the A6300’s really benefit from a touch screen, as I found with the Nikon DSLRs. There are 28 menus on the A6300. Okay, technically, menu pages, but it’s as if they’re individual menus, as up/down steps don’t scroll you to the next menu page when you hit the end (they go to the tab and then back into the menu). Indeed, while the tabs are easily accessible (hint: turn Tile Menu on, though that might give you a NEX deja vu), I’ll bet you that most people actually never use them. They just cycle through the pages until they find what they want to set. Also, like Olympus menus, the Sony menus are starting to get acronyms and names that simply don’t fully describe what the setting is, or are just confusingly named, and there’s no help system to decipher anything for you. Moreover, we have focus settings on multiple pages, and each of those pages have other settings on them. Apparently someone at Sony HQ throws a 54-sided die to decide which item appears on which Camera Settings menu page. Moreover, they think the world prefers sideways scrolling to vertical scrolling. A lot of this is the NEX hangover. Sony tried to do something different and innovative with the NEX UI, got slapped for it, and rather than completely fix it they merged it with another UI that was better received. I don’t consider the Sony menu system anywhere near rationalized or optimized. I have to set considerable time aside every time I get a new Sony camera now to make sure that I’ve set everything up the way I want the camera to shoot, and small menu shifts and changes coupled with the not-always-clear naming just makes this a pain. And why the heck are we getting abbreviations when there’s plenty of display room for the full and descriptive name?!?! Also “key” is not the same as “button,” Sony. The sad thing is that menu systems should be easy to fix and make better when you iterate cameras constantly. Yet it’s not really happening at Sony (or Olympus). When Sony’s marketing department really starts talking to customers and wonders why they get “the camera feels geeky to me” types of answers, guess where they should look? I said this would be difficult. It is, because once I’ve gotten the A6300 configured the way I want it to be, I generally don’t have much in the way of handling issues to report. The controls are tiny and some of the buttons I programmed are hard to find by feel. The control wheel doesn’t do much. Yet still, I tend to just shoot and shoot and shoot and the camera tends to disappear, which is exactly what should happen. The big handling disconnect on the A6300 happens when I want to change something. Fortunately, there’s the programmable Fn button, which acts as a quick menu for most things you’d want to change if you set it up correctly. So overall the handling is fine, once the camera is set up properly. Not optimal, but fine for use. Getting it there is a bit of a pain, though, as it requires dipping into the menu system and understanding what it is you’re configuring. Autofocus: The big question everyone wants answered is whether or not Sony’s DSLR-level claims of autofocus performance are accurate. I’d say yes and no. Certainly the A6300 improves on the A6000’s already very good autofocus performance. Indeed, the A6300 definitely improves in the A6000’s weakest area: tracking erratic subject motion. Moreover, the face detection feature can be uncanny in many situations, at least with humans. Single servo autofocus is fast and reliable. In some ways more reliable than a DSLR, as Sony uses a final “contrast detect” step to optimize the initial focus guess. Continuous autofocus is generally fast, but slightly less reliable. I’d say that Sony is still relying on depth of field rather than correcting the phase detect decision in continuous autofocus, and that’s mostly evident on highly erratic subject movement. Better than before, but still not perfect. Aside: I’ve written it before. On sensor phase detect has lower discrimination of actual focus plane than mirrored system phase detect that DSLRs use. But it has the advantage of being near instantaneous to the exposure and available across a wider area of the frame. Sony seems to be letting some of this lower discrimination come into play in continuous autofocus, and sometimes skipping a contrast detect correction. Thus I see very small misses in focus plane in continuous autofocus on fast moving subjects that I don’t see on more static subjects and single frame shooting. Ironically, DSLRs tend to be just about the opposite: they don’t correct any phase detect error on a single snap, but they definitely track movement better and with fewer misses. But probably the most improvement isn’t the focusing system itself, but the EVF. The old slide-show-with-gaps problem of shooting continuous action with the A6000 is gone, though it will put you back to 8 fps if you set the new advanced viewfinder function (you should). It is far easier to keep the A6300 glued on your moving subject while looking through the viewfinder than on virtually any other mirrorless camera (the Samsung NX1 is one exception). Buffer: 21 or 22 raw files, basically. Coupled with the 11 fps capability, and we’re at less than two seconds. Even at 8 fps with the viewfinder continuously updating we’re barely at 2.5 seconds of action. Those that lean on spray-and-pray type shooting probably won’t be satisfied with that. But I found it more than adequate. JPEGs: There’s no perfect way to compare JPEGs between cameras, as each maker seems to set defaults that aren’t quite optimal, and the range of things you can change from those defaults is different. So I’m going to tell you my observations at default settings compared to another 24mp APS sensor camera I’m quite familiar with (e.g., the Nikon D7200), plus add a few deviations from the defaults. Sony, like many tends to use a bit of a twist to their hues. This shows up as green in the yellows, red in the magentas. There’s nothing wrong with this, though I personally prefer no hue shifting and twisting at all. I’ve long stated a preference for Nikon’s Neutral Picture Control, to which I’ll add my own color shifts, thank you. Still, overall, Sony doesn’t do a lot of shifting as much complication in the color model as do Canon and Fujifilm, for instance. Nor do they put as much contrast and saturation in as does Olympus. I can live with Sony’s Standard and Neutral Creative Styles, less so their Vivid and other choices. Sony also seems to be fairly high on the “correction” side of things. They put more sharpening in by default than I’m used to with Nikon, and more visible noise reduction. To be honest, Nikon puts too little sharpening in their default JPEGs, though. At modest ISO values—say up to 1600—Sony’s choices are fine, and produce sharp, well rendered images. But the colors and edges fall apart faster at high ISO values, in my opinion. To me, the Sony high ISO JPEGs (e.g. 6400 and over) just have too much processing in them, and they look a bit plastic and artificial. Color fringing starts to be an issue on small detail, too. Compared to the Nikon D7200 at high ISO, the color integrity of the Sony seems a tiny bit off, with some colors, such as green, darkening faster due to the noise build. The Sony shows slightly more detail than the Nikon at similar settings, but this comes at the expense of revealing some color fringing. The Nikon has uglier edge artifacts when they appear, the Sony uglier detail. You can’t really win this game. This isn’t to say that ISO 6400 isn’t usable on the Sony. It is. But I’d suggest that you pay close attention to the Contrast, Sharpening, and High ISO NR settings and look for a combination that’s not quite as obvious in how it is touching the data, even if that means a bit more noise in the image. Overall, I’d put the Sony A6300 JPEGs on par with those of the Nikon D7200, assuming that you don’t just let the camera run on autopilot all the time and find your own blend to minimize shifts and artifacts. I will say that shooting JPEG with a Sony is more natural to me coming from a Nikon than say a Canon, Fujifilm, or Olympus is. Raw: The Sony A6300 looks a lot like my D7200 shooting raw. Unfortunately, if you’re using an Adobe converter you’re going to see some slight differences due to unseen corrections that Adobe puts in before the sliders are brought up. 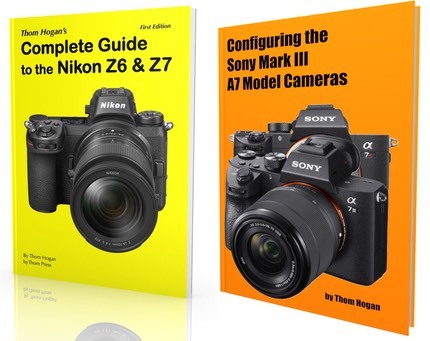 Still, even with those differences, the A6300 and D7200 look more like twins than siblings. Indeed, I’d tend towards saying that any difference I’m seeing could even be sample deviation (they don’t share the same exact sensor, but they share the same sensel and sensor structures and much of the same sensor technology). Noise up through ISO 800 is present, but mostly luminance and with a good randomness to it. At ISO 1600 color noise becomes significant enough that you’ll want to reduce it, but it’s still very controllable without destroying your detail. ISO 3200 is about as far as I push my D7200, and I’d say the A6300 is about the same. I do think I see a bit more color noise at ISO 6400 and above on the Sony, but again, this could simply be something other than the sensor itself. The Sony A6300 tends to run hotter than the D7200 in constant shooting, which will impact noise propagation. Overall, the image quality of the A6300 is on par with the best of the high end of the crop sensor DSLRs, which is exactly where you’d expect it to be. I do wish Sony had brought their truly lossless raw option to the A6300, though. Sony had a winner in the A6000, and they’ve clearly improved it in the A6300. To me the only significant improvement is the EVF: it’s better looking and the new fast drive mode does help with shooting continuous motion. Beyond that, though, I find most of the marketing proclamations to not be showing up quite at the volume they were made at. Focus, for instance, is somewhat better than the already good A6000, but it doesn’t match DSLRs. As with the A7 Mark II models what I find in continuous autofocus is that Sony tolerates more “near misses” than I do, and that I achieve on my pro DSLRs. On the other side, things like Face and Eye Detection on the A6300 are sometimes useful features that my DSLRs don’t have in their focus system. Overall, I’m finding the A6300 to be a very credible and useful camera, though. I used it as my primary camera on a recent trip, which ended with my coverage of the NAB Convention in Las Vegas. It’s a great little travel camera, and with the right lenses, stays compact yet capable. It’ll take you some time to customize the settings and controls to your liking—the defaults are a messy hodgepodge—but once I had done that the camera started to disappear and I could just concentrate on that big, bright EVF. The thing that will stop a few folk is the design. Unlike Fujifilm and Olympus, who are apparently regressing their designs back to the film days, Sony clings to a more gimmicky and small overloaded button structure. The controls look like a high-end compact camera, not a high-end prosumer camera, and a lot of people judge on looks alone, unfortunately. If they do, they’ll miss out on using one of the best mirrorless camera options out there, certainly one of the very best in the US$1000 price point.